Carriere Family Farms has been in the walnut farming business since 1963 when Herb and Aileen Carriere bought their first orchard along the Sacramento River. The fertile soil along the river and the overall climate in Northern California provided ideal growing conditions for walnuts. Since our first orchard was planted over five decades ago, Carriere Family Farms has developed many more acres in the area. We grow 10 different varieties of English Walnuts. The main three varieties are Chandler, Howard and Hartley, and many of our orchards have implemented the new technique of high-density planting. The range of varieties allows us to harvest each variety at the peak of ripeness and spread our harvest out over the two-month harvest season. Carriere Family Farms follows an Integrated Pest Management approach, utilizing the latest in research and technology to keep quality at peak levels while minimizing costs and potential negative impacts on the environment. We manage and farm orchards in five different locations in Glenn and Colusa counties, employing 13 full-time employees, several whom have been working on the ranch over 20 years. With the fifth generation of family members joining the operation in many different facets of the business, Carriere Family Farms strives to continue the tradition started by Herb Carriere ~ to produce the highest quality walnuts possible while contributing to the prosperity of our family, employees, customers and community. A few years after purchasing our first orchard in 1963, Herb Carriere decided that it would be beneficial to control our own walnut hulling and drying. Utilizing an existing barn on the ranch, he installed our first walnut huller and dryer, and within a few years, installed a second one. Carriere Family Farms is now planning on building a third facility in anticipation of the upcoming acreage coming into production. We shred and/or chip all of the prunings from the orchards to eliminate the smoke pollution that results from burning each year. We have also installed a new solar technology called a “Solar Wall,” which preheats the air entering the dryer with heat from the sun’s rays, which has reduced our natural gas usage by 12%. 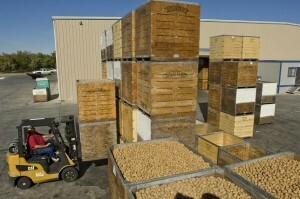 In 2000, Carriere Family Farms made the transition from grower to processor and marketer of California Walnuts. 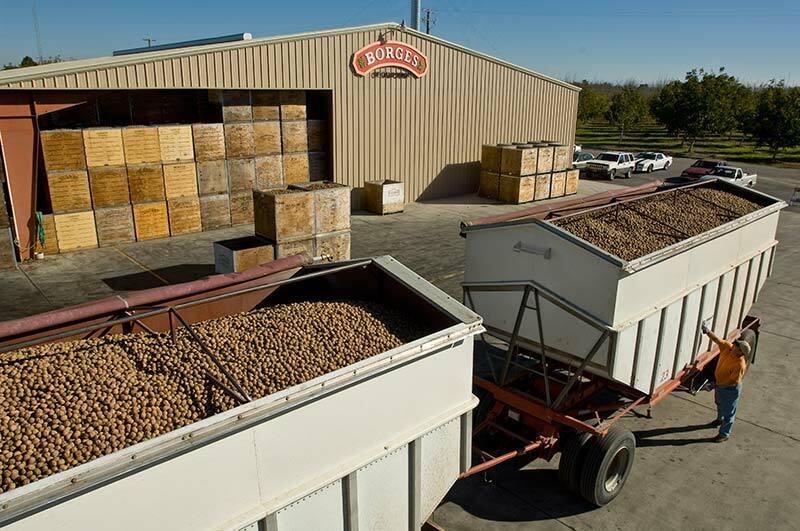 In October of that same year, we partnered with Borges of California to open an inshell plant and started processing California Walnuts. 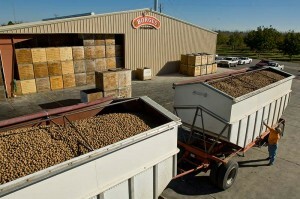 Since then, we have continuously increased the amount of inshell walnuts we process, pack and ship. The growth has been both substantial and educational. 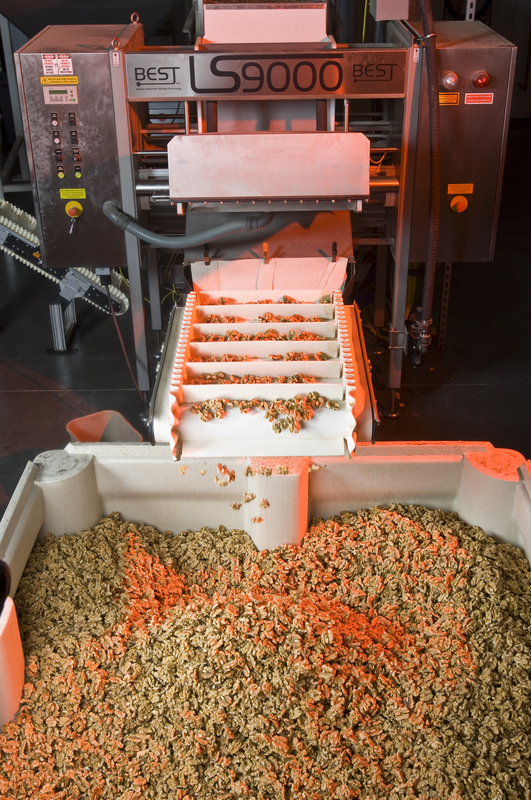 In 2006, we decided to utilize what we learned to take the business to the next level by launching a shelling line to round out our walnut processing operations. The sheller added an exciting new dimension to our operation. Typically, the inshell market is all about speed; getting product packed and shipped before November 1 is necessary to meet the inshell market demand in Europe. The shelling market, however, is a steady process that keeps us shelling and packing most of the year. With the recent addition of a new concrete storage building and a cold storage facility, we can ensure the highest quality product year-round. Having an inshell and shelling plant has made Borges of California and Carriere Family Farms a one-stop shop when it comes to handling customers’ walnut needs. We can ship year-around and in many different sizes to meet the customers’ demands. Carriere Family Farms takes pride in implementing proven technologies, Good Manufacturing Practices (GMPs), and HACCP controls throughout all of our facilities. We strive to stay ahead of the curve when it comes to food safety regulations, and we take pride in understating the needs and expectations of the market and our customers. When it comes to the ongoing demands of the Food Safety Modernization Act (FSMA), Carriere Family Farms understands what it takes to maintain a safe and clean production environment. We are dedicated to a clean environment as shown by our fully staffed sanitation crew on both our day and night shifts. We are currently working towards our goal of becoming SQF-certified (Safe Quality Food) in 2014. The Safe Quality Food Institute is recognized worldwide by retailers and foodservice providers who require a rigorous, credible food safety management system. Using the SQF certification program streamlines assessment and improves the consistency of assessment standards. Additionally, the SQF Program is recognized by the Global Food Safety Initiative (GFSI). Learn more at the SQF Institute website. We use BEST laser sorters to ensure that foreign material is identified and removed prior to packing. Aspirators are used going into and coming out of the packing room to give us another chance to remove shell and meal. The material passes over a magnet and then through a metal detector before being palletized and prepared for shipment.